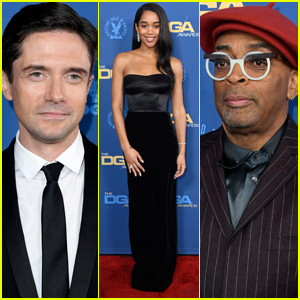 Laura Harrier and Topher Grace hit the red carpet as they arrive at the 2019 Directors Guild of America Awards on Saturday night (February 2) at the Ray Dolby Ballroom in Hollywood, Calif. The BlacKkKlansman actors stepped out to support their director Spike Lee – who was nominated for Outstanding Directing – Feature Film. Other stars at the event included Eighth Grade director Bo Burnham and star Elsie Fisher, Roma director Alfonso Cuaron and stars Yalitza Aparicio and Marina De Tavira, Sharp Objects director Jean-Marc Vallee, The Marvelous Mrs. Maisel creator Amy Sherman-Palladino, and actors Brian Tyree Henry, Tony Hale, and Keesha Sharp. FYI: Brian is wearing a Hugo Boss suit. Elsie is wearing an Akris outfit. Yalitza is wearing a Delpozo dress, Jaipur Gems earrings, and rings by Shee’s and Yvan Tufenkjian. Marina is wearing a Giambattista Valli dress, Harry Kotlar earrings and a ring, and a Le Vian ring. Tiffany Haddish Gets Honored with Rising Star Award at American Black Film Festival Honors 2018! Tiffany Haddish is all smiles as she hits the carpet at the 2018 American Black Film Festival Honors Awards held at The Beverly Hilton Hotel on Sunday (February 25) in Beverly Hills, Calif. 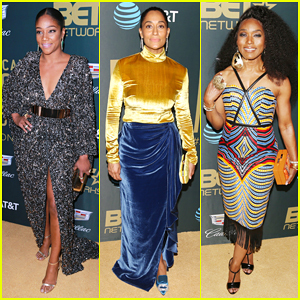 The 38-year-old Girls Trip star was joined at the event by Tracee Ellis Ross, Angela Bassett, Issa Rae, Regina Hall, Bresha Webb, Lil Rel Howery, Anika Noni Rose, Omari Hardwick, DeWanda Wise, Dennis Haysbert and Keesha Sharp. Omari received the Distinguished ABFF Alumni Award and Tiffany was given the Rising Star Award at the ceremony, which also handed out competitive trophies to best TV comedy winners Black-ish and Insecure, best TV drama Queen Sugar, and movie of the year Get Out. FYI: Tiffany is wearing a Michael Costello dress and Jimmy Choo clutch and shoes. Tracee is wearing a Prabal Gurung bodysuit and Norman Silverman jewelry. Angela is wearing a Mangishi Doll dress. Issa is wearing an Oscar de la Renta dress. Greta Gerwig Says 'It's Time' for More Female Directors To Be Recognized! Greta Gerwig is all smiles while hitting the red carpet at TheWrap’s 2018 Women, Whiskey and Wisdom Celebrating Women Oscar Nominees held at Teddy’s at The Hollywood Rooselvelt Hotel on Wednesday (February 21) in Hollywood. The 34-year-old Lady Bird writer-director was joined at the event by Keesha Sharp, Jane Seymour, Get Out‘s Betty Gabriel, Caitlin Carver and Helena Mattsson. Greta recently opened up about what it feels like to be the fifth woman ever to be Oscar-nominated for Best Director. Emily VanCamp, Angela Bassett and Jamie Chung happily strike a pose while attending the Fox All-Star Party held during the 2018 Winter TCA Tour at The Langham Huntington on Thursday (January 4) in Pasadena, Calif. The ladies were joined at the event by Emily‘s The Resident co-stars Shaunette Renée Wilson, Manish Dayal, Melina Kanakaredes and Bruce Greenwood, Angela‘s 9-1-1 castmates Brielle Barbusca and Oliver Stark, as well as Jamie‘s The Gifted co-stars Natalie Alyn Lind, Amy Acker, Blair Redford, Skyler Samuels and Emma Dumont. Also in attendance to represent their shows were Lethal Weapon‘s Jordana Brewster, Michelle Mitchenor, Chandler Kinney and Keesha Sharp, Brooklyn Nine-Nine‘s Stephanie Beatriz, The Mick‘s Kaitlin Olson, Thomas Barbusca and Sofia Black-D’Elia, Ghosted‘s Amber Stevens West, Gotham‘s Crystal Reed, The X-Files‘ Mitch Pileggi, New Girl‘s Lamorne Morris, Lucifer‘s Aimee Garcia, Tricia Helfer and Lesley-Ann Brandt, and LA To Vegas‘ Ed Weeks, Kim Matula and Olivia Macklin. FYI: Jamie is wearing Veronica Beard, Imagine Vince Camuto shoes, and a Jimmy Choo clutch. Jordana is wearing a David Koma dress. Sofia is wearing a Narciso Rodriguez dress. Olivia is wearing Off-White c/o Virgil Abloh. Skylar is wearing Kimora Lee Simmons with Casadei heels. Kaitlin is wearing Keepsake The Label jumspuit. Crystal is wearing a Phillip Lim suit, Everlane top, Marc Fisher shoes, M2Malletier bag and Valani jewelry. Amber is wearing Rebecca Vallance. Natalie is wearing Mugler. Kim is wearing Bronx and Banco with Nine West shoes. Manal is wearing Vince Camuto boots. January Jones, Tom Welling & Jordana Brewster Kick Off Fall Season at Fox Premiere Party! January Jones, Tom Welling and Jordana Brewster hit the carpet while attending the Fox Fall Premiere Party held at Catch LA on Monday (September 25) in West Hollywood, Calif.
January, 39, was joined at the event by her The Last Man on Earth co-stars Will Forte, Cleopatra Coleman and Kristen Schaal, Tom‘s Lucifer co-stars Aimee Garcia, Tom Ellis, Lesley-Ann Brandt, Tricia Helfer and director Len Wiseman, and Jordana‘s Lethal Weapon cast mates Damon Wayans, Clayne Crawford, Keesha Sharp, Michelle Mitchenor, Johnathan Fernandez and Michelle Mitchenor. Also in attendance in support of their shows were Brooklyn Nine-Nine‘s Andy Samberg, Terry Crews, Stephanie Beatriz and Melissa Fumero, The Mick‘s Kaitlin Olson, Sofia Black-D’Elia, Jack Stanton and Thomas Barbusca, Gotham‘s Crystal Reed and Robin Lord Taylor, The Orville‘s Seth MacFarlane and Halston Sage, The Gifted‘s Natalie Alyn Lind, Ghosted‘s Adam Scott, Amber Stevens West and Craig Robinson, The Exorcist‘s Alfonso Herrera, John Cho and Brianna Hildebrand, and Hell’s Kitchen host Gordon Ramsay. FYI: January is wearing The Vampire’s Wife with Loren Stewart jewelry, a Bulgari watch, and Marion Parke heels. Halston is wearing an Alexander Wang dress. Natalie is wearing a Dion Lee dress. Jordana is wearing a J. Mendel dress and Giuseppe Zanotti shoes.